This seems like an excellent summary of Josh. The 18-year-old athlete is constantly in motion, participating in a variety of sports including football, hockey, rugby, volleyball and tennis. 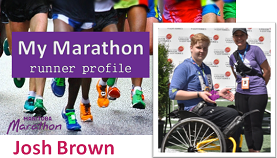 Along with all of this, Josh participated as a wheelchair athlete, in 2017 in the Intrepid Dezine Half Marathon and in 2018 taking first place wheelchair in the Manitoba Liquor & Lotteries Full Marathon. This fall he made a major life change to pursue his passion: he moved from his home in East St. Paul, MB to Toronto to go to school and play wheelchair basketball. It doesn’t seem like Josh is going to let much stop him from reaching for his dreams. And he is just getting started. Why do you participate in the marathon? 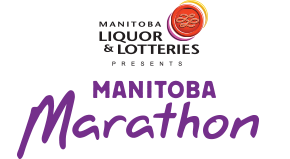 I participate in the marathon through the Manitoba wheelchair basketball program. My coach had suggested we try it a year back so I joined in last year and did the half marathon in my wheelchair then decided to do it again. What was the most personally challenging race you have ever completed and why? Actually I think this full marathon was the hardest because I haven’t really done any other races. This was hard because it is so easy to give up when your arms hurt but the main piece to be successful is to have the mental ability to keep going. My favourite post recovery snack is chocolate milk. What is your number one method for injury prevention? My number one injury prevention method is to always stretch before and after any sort of work out and always have some sort of post recovery snack handy for after. What do you find to be your biggest challenge in competition? How do you overcome these obstacles? The biggest challenge for me is having to find the time to train as well as live my life and be successful in both. Trying to find time to work out and become a better athlete as well as school, and a job as well as just living. I overcome this by having family and friends help me balance out both as well as keep my mind in it. What goals have you set for yourself in the past year? How have you worked to achieve them? My goal before coming to this full marathon was to actually complete it. I was successful in this because of the help of the people around me especially when in the marathon. To have family and friends support you is so important and gives you that extra push to keep on going. What does race morning look like to you? Any rituals, habits or mantras that you go through to get ready? Race morning is pretty simple for me. Honestly I wake up and usually either have a smoothie or egg then get my wheelchair in the vehicle and go to the race and set up. Once I am there and at the start line I take a second to breathe and just go. What is your number one “get pumped up for a great race” song? One song I really like is by One Republic “I Lived”. Do you have a role model or a training buddy or coach that you want to give a shout out to? Anyone who keeps you going or contributes significantly to your training? A couple people who have helped me not only through the marathon process but my wheelchair basketball career so far. The first person would be my wheelchair basketball coach Jarret Yaworski. He has spent countless hours helping me become a better player and a better person. There are no words to describe how much I appreciate the amount of work he has put in to help me. The other person would be my dad, Dave Brown. He has spent many hours and lots of money to help me be successful. Not only that but he has given me so many tips through his experience in coaching.